The town gets its name from Ramgiri Hills, popularly known as Sholay Gudda, since all locations made famous in the movie are visible from the top. As we approached Ramanagara after a 50-km drive from Bangalore, the towering rock formations that formed the backdrop of the blockbusters Sholay and A Passage to India loomed into view. 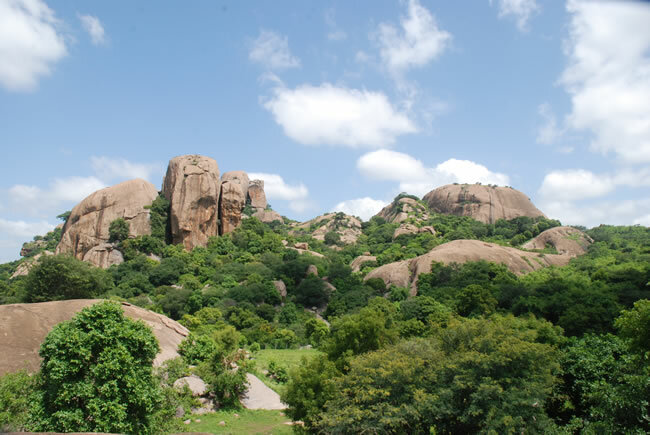 Though the legendary Bollywood film Sholay was shot 44 years ago against the stunning, sheer granite cliffs of Ramanagara, the memories of Gabbar Singh, Basanthi and Thakur still linger in the hearts of the villagers and in their lives. Even now, every dialogue spoken by Gabbar Singh, the villain, such as “Arre O Sambha, kitne aadmi the”, “Tera kya hoga, Kaalia” is remembered and repeated. As a mark of respect, the people of Ramanagara have rechristened a hamlet as Sippy Nagar after the director of the movie, Ramesh Sippy. Ramanagara is steeped in history. Apart from being a reputed movie locale, it is famed for its historical temples, mosques, and clusters of towering rock formations. During the British period, this place was known as Closepet, named after Barry Closepet, who was the first adjutant general of erstwhile Mysore. Tipu Sultan strengthened the fort and made it a storehouse for his arms and ammunition in 1791 CE around the 3rd Mysore War. It was his bastion during the several wars he fought with the British. The place was renamed Ramanagara after Independence. The present town has an agrahara on the left bank of the Arkavati river with a temple of Arkeshwara built in the Vijayanagara style. One can also see a sprinkling of historical burial sites and the ruined fort called Ramagiri Durga of Kempegowda built in 1530 CE. It is surrounded by the Anna-Thama rock formation on the left and Handi-Gundi on the right. During weekends, techies and adventure buffs head to this place to indulge in a multitude of activities like bouldering, bird-watching, mountain biking, rock climbing, rappelling and trekking. 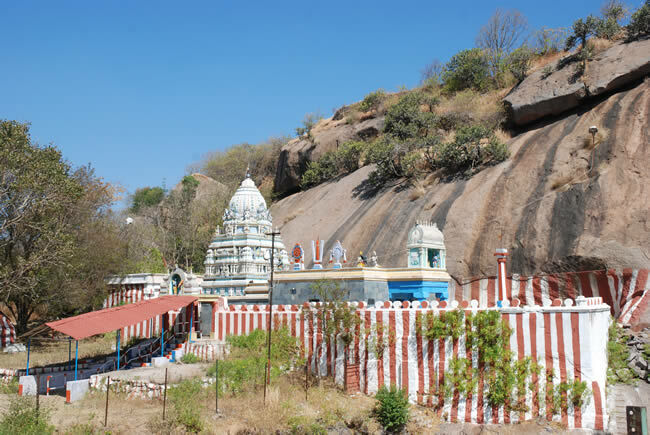 The town gets its name from the Ramgiri Hills or Ramadevara Betta, a hillock outside the town, which has a Rama shrine atop and a fenced-in natural pond. The interesting feature of the hilltop is the conspicuous absence of crows here. 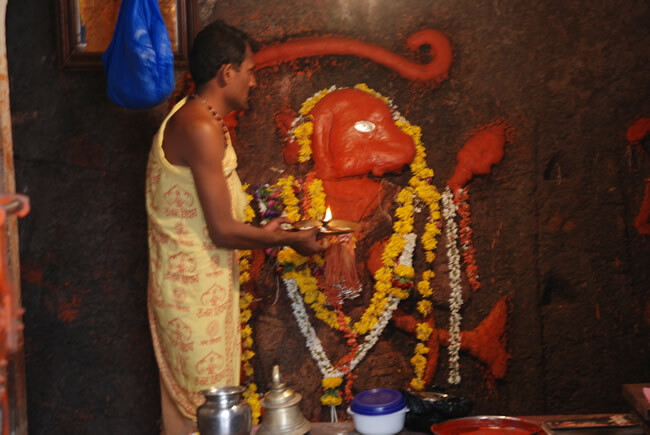 The story behind it is that Rama had cursed Kakasura for disturbing Seetha. The hillock is popularly known as Sholay Gudda, since all locations made famous in the movie are visible from the top. The fabulous view from the hilltop is worth the 350-step climb. We clambered up a jagged path flanked by shrubbery leading to the Kodandarama shrine and the fenced-in natural pond called Ramatheertha. En route, we stopped by an Anjaneya temple at the 250th step. As we climbed up, our guide regaled us with stories associated with the area. A few rough trails also lead to higher rocky hills. We had to climb a little further, to reach the top. The last flight of steps seemed daunting at first but with railings to hold, we managed to reach the peak easily. The marvellous view from the top made the arduous climb well worth it. We had a panoramic view of the small hills around with towering granite monoliths, the picturesque countryside, Saptharishi Betta which resembles seven idols from different angles, and vehicles moving on the Bangalore-Mysore highway. The downhill trek was much easier as we took a detour through a scrub jungle. We strolled leisurely in the lap of nature with our resourceful guide sharing many interesting facts about the varied flora and fauna of the region. While climbing up the hill, we noticed holes high up in the rock face, presumably the nesting site of the critically endangered long-billed vulture. Ramanagara is the last remaining habitat of these vultures in south India, and the surrounding environs provide excellent bird-watching opportunities. We also spotted yellow-throated bulbuls. The hillock also shelters bears, leopards, porcupines, jungle fowl, wild boar and snakes but we were not lucky enough to spot them. The lofty pillar rock formations and their innumerable cracks and fissures have made Ramanagara a Mecca for rock climbers. 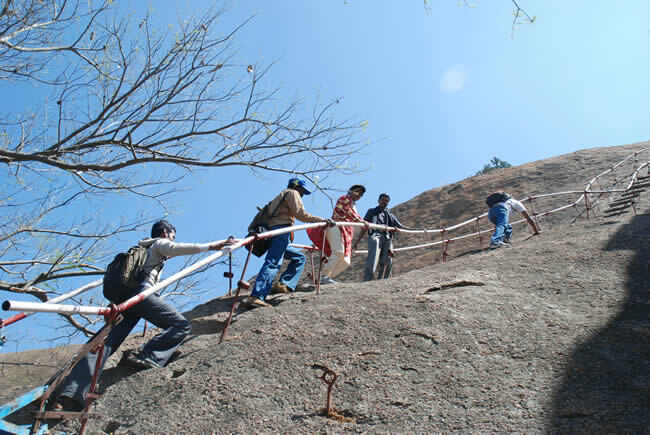 There are two main climbing areas here – the Ibrahim farm area and the Ramgiri pillar area. The best place to head to are the 3 peaks, huddled together at the village of Ramgiri. After lunch, we were all energised for the next instalment of activity. We tried cave exploration, another much-sought after adventure. We realised that it is definitely not for the faint-hearted as we had to literally crawl in some places. 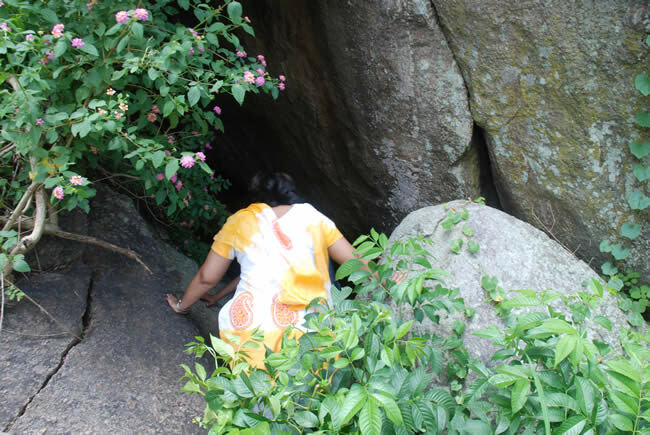 The fun part of Ramanagara that we had been waiting for, Sholay Trails – forays to the spots where Sholay was shot, was next on our list of activities. This turned out to be the highlight of our trip. Before returning to the starting point, our guide escorted us to where Basanthi was forced to dance on broken bottles to keep Veeru alive; Thakur’s house; Gabbar’s den, and so on. They referred to the characters as if they hailed from their own village. It was time for us to leave but we promised to return after the monsoon to camp under a starry sky. All photographs by Susheela Nair. Susheela Nair is an independent food, travel and lifestyle writer, and photographer based in Bangalore. She has contributed content, articles and images on food, travel, lifestyle, photography, environment and ecotourism to several reputed national publications. Her writings constitute a wide spectrum, including guide books, brochures and coffee table books.